England are on the verge of a place in the last eight of Euro 2017 after a hard-fought, and eventful, 2-0 win over Spain in Breda. Fran Kirby swept home a wonderful opener after just two minutes before Millie Bright had a header harshly ruled out. Spain, who dominated for large spells, were denied a second-half penalty in bizarre circumstances before Jodie Taylor wrapped up all three points in the dying embers. 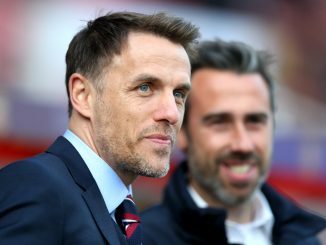 The result leaves Mark Sampson’s side top of Group D with six points from six and needing just a point from their final match against Portugal to confirm a spot in the quarter finals. England were unchanged from Wednesday night’s win over Scotland with hat-trick hero Taylor up top alongside Kirby. There was a hairy moment after 45 seconds when captain Steph Houghton slipped on a soaking wet pitch, allowing Arsenal midfielder Vicky Losada a clear shot at goal from the edge of the area. Thankfully for England it flew just wide. And Spain were made to pay only seconds later as Ellen White slipped a through ball to Kirby who opened her body and finished with aplomb to give her side a dream start. Bright thought she had doubled the lead in the sixth minute when she powered home a header from a Jordan Nobbs free-kick, but it was chalked off by referee Carina Vitulano. It would have been the Chelsea defender’s maiden international goal. Houghton then blasted over from inside the box to conclude a frantic opening period. Spain attempted to get a foothold in the game until the flow of the first half was somewhat affected by a torrential downpour. When the rain did relent, Jorge Vilda’s side enjoyed more of the ball but were unable to find a way past the dominant centre back pairing of Houghton and Bright. It was more of the same after the break as La Roja controlled possession, yet without causing any real threat to Karen Bardsley’s goal. Isobel Christiansen came on for Kirby midway through the second half and occupied the left-wing berth, with White joining Taylor upfront. Then came a huge talking point. White was initially deemed to have handled the ball inside the box and Vitulano pointed to the spot, but after some deliberation the referee overturned her own decision, much to the relief of every England fan and player inside the Rat Verlegh Stadium. The game was to put to bed with just five minutes remaining when Taylor was played in by Nobbs to clip a 12-yard shot over the dive of the on-rushing Sandra Panos. The Lionesses are just one more positive result away from the knockout stages. 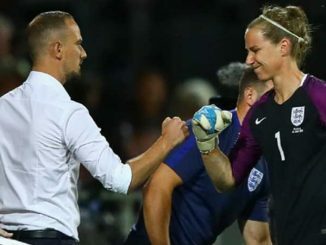 England (4-4-2): 1 Karen Bardsley (Manchester City); 2 Lucy Bronze (Manchester City), 5 Steph Houghton (capt; Manchester City), 16 Millie Bright (Chelsea), 3 Demi Stokes (Manchester City); 7 Jordan Nobbs (Arsenal), 11 Jade Moore (Reading), 4 Jill Scott (Manchester City), 18 Ellen White (Birmingham City); 23 Fran Kirby (Chelsea), 9 Jodie Taylor (Arsenal). Substitutes: 8 Isobel Christiansen (Manchester City) for Kirby 69, 19 Toni Duggan (Barcelona) for White 79, 6 Jo Potter (Reading) for Taylor 90. Substitutes not used: 10 Fara Williams (Arsenal), 13 Siobhan Chamberlain (Liverpool), 14 Karen Carney (Chelsea), 15 Laura Bassett (Unattached), 17 Nikita Parris (Manchester City), 20 Alex Greenwood (Liverpool), 21 Carly Telford (Chelsea), 22 Alex Scott (Arsenal). 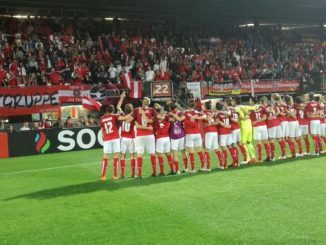 Spain (3-5-2): 13 Sandra Panos; 3 Marta Torrejon (C), 5 Andrea Pereira, 4 Irene Parades; 7 Marta Corredera, 14 Vicky Losada, 15 Silvia Meseguer, 11 Alexia Putellas, 21 Leila Ouahabi; 10 Jennifer Hermoso, 8 Amanda Sampedro. Substitutes: 17 Olga Garcia for Losada 73, 19 Barbara Latorre for Ouahabi 90, 6 Virginia Torrecilla for Sampedro 90. Substitutes not used: 1 Dolores Gallardo, 2 Celia Jiminez, 9 Maria Paz, 16 Alexandra, 18 Esther Gonzalez , 20 Maria Leon, 22 Mariona Caldentey, 23 Paula Nicart.